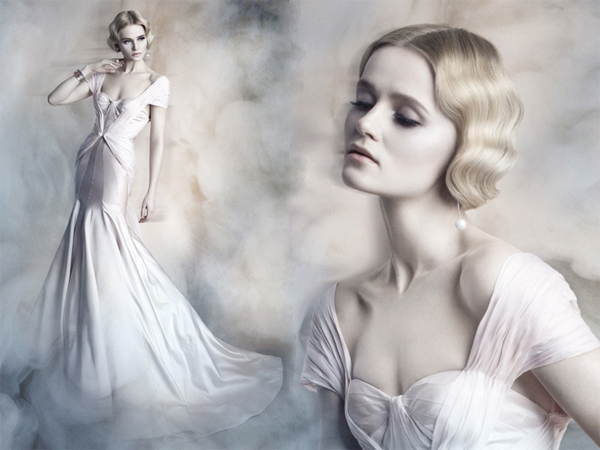 Home » Posts Tagged "illusion bob"
As I marvel at the hair wave statement being made on PBS’s “Downton Abbey” every week– even more wonderful this season – I keep thinking of the Vivienne Mackinder waves from her 2012 Bridal Amour Collection. This waving beauty had her hair Marcel waved, then gathered into a low chignon to create the illusion of a bob. So similar, so beautiful, don’t you think? “Once in a while, right in the middle of an ordinary life, love gives us a fairytale,” the WorldGreat said at the time about her modern, fresh bridal designs, many of which are on the website, click here and scroll through.